So the gilt frame has moved a few repeats, still four more to do. 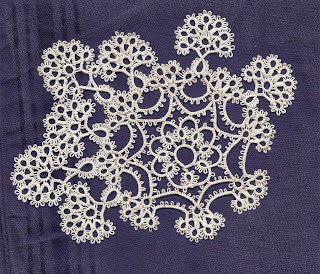 The Oeillets doily has now five small and two large carnation motifs added to the centre.At first I thought it would be best to work the motifs one by one but I soon discovered it would be best to do the small motifs first and add the longer ones afterwards. Look what arrived in the post! Another package from les Greniers de BD, a box of thread, and this lovely original booklet from the 1920's. Look at these plates, I want to try some of these patterns very soon. The doily is absolutely beautiful!!! Where is the pattern from? 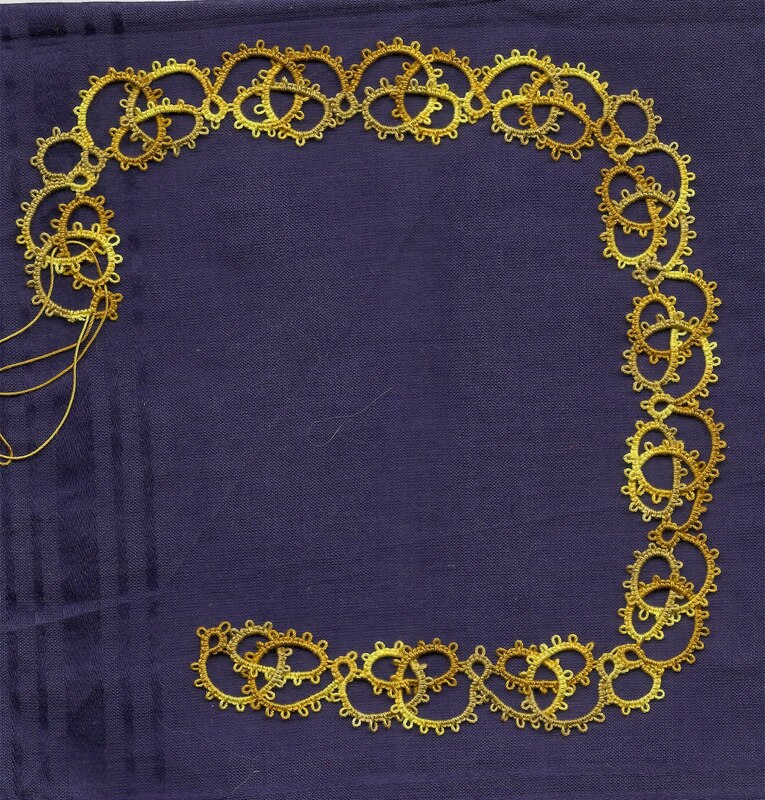 The gilt frame and doily look wonderful! 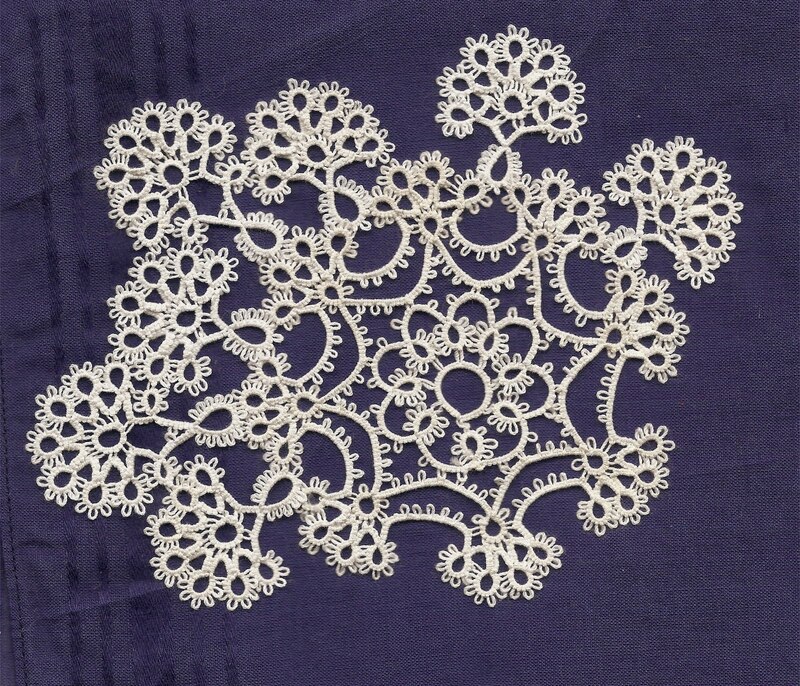 The doily reminds me of Queen Anne's Lace. The book looks like it has some great patterns! I absolutely LOVE the Oeillets pattern! It's gorgeous. That vintage thread is working up beautifully in the doily, isn't it! - it's looking great. I'm nervous about vintage threads, since I bought a bagfull from an antique shop years ago - it was from Scotland, and with one exception, every single ball was brittle and the thread snapped. You have done much better with your vintage purchases and I'm looking forward to seeing the doily finished. Your tatting is a joy to look at. I tatted all of those motifs a few months ago for a project. I believe I wrote them up in modern notation. I'd be happy to send you a copy if you like. You could test my version. Michelle the doiley is from a book called "La Frivolité, fine et precieuse" do let me know if you want more details. Diane, thank you, yes the motifs are quite frothy... and I was surprised by the booklet. Maureen, I hadn't realised the risk I was taking, but reading about thread on In-tatters I realise I was pretty lucky. I haven't tried it all, but so far no incidents. Gina, I would appreciate seeing your modern notation, I was planning just to try with a sketched diagram, but I know how complex the old pattern writing is, I was looking and puzzling last night. Do you need my email?